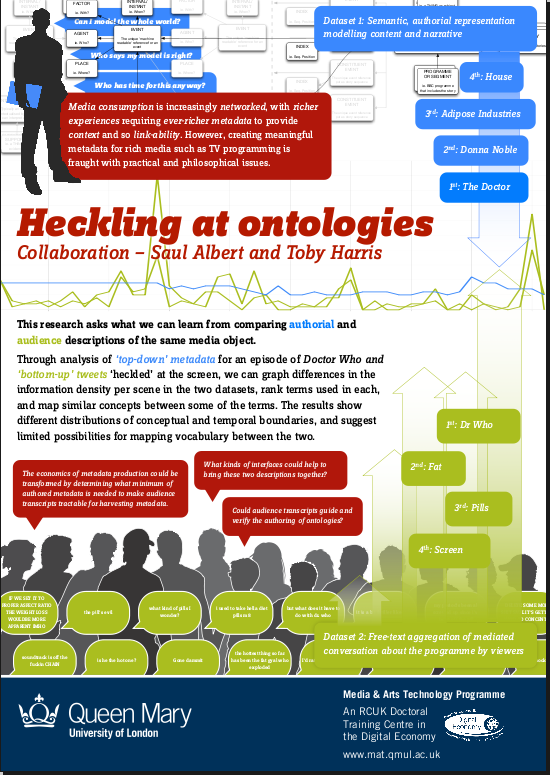 Heckling at Ontologies explored the relationship between TV-viewers’ text chat and TV broadcaster media metadata. This was one of the outcomes of Toby’s industrial placement at the BBC, which developed an ontology for rich description of BBC programme content and then used it to create a highly detailed summary of a specific episode of Doctor Who. As part of an industrial placement at BT, I worked with The People Speak to develop a new version of Heckle, a web service that gathers tweets, images, videos and texts ‘heckled’ to a shared screen by viewers of a TV show, building up a visual summary of the mediated conversation. These two data sets were analysed to discover the dissonances and regularities between Toby’s top-down and my bottom-up descriptions of the same TV show. The two data sets were then superimposed on a live stream of the video. You can download the source of the demo and grab copies of semantic data on the ontoheckle github page. Toby Harris’ documentation of the project. Industrial Partnes/Collaborators @ BBC Stories: Rowena Goldman – Strategic Partnerships, BBC R&D, Paul Rissen – BBC Future Media & Technology, Dr. Michael Jewell – Goldsmiths College University of London, Dr. Tassos Tombros – Queen Mary University of London. Thanks to all the participants in the Dr. Who screenings, Richard Kelly, and The People Speak.